Well, spoiler, but am I ever pleased I picked this one up off my TBR pile. And also that Saga set February ebook prices for their titles at $2.99; what an inviting price when you are already kind of inclined to try a new release, which I have been since it hit the shelves last year. Or because of the title, which is just the kind I like best, evocative and puzzling. And, by the way, eventually put into proper context by the story. To my surprise, when I googled Gilman’s backlist, I discovered that this is the first book by her I’ve actually read. Honestly, I thought for sure I’d read others of hers, but no. She’s written, let me see, a high fantasy trilogy, it looks like, and a bunch of urban fantasies in at least three different series, plus a series of what look like cozy-ish pet-centered mysteries (under the name LA Kornetsky). If any of you have tried her other work, have you got any particular recommendations? Because, after reading SILVER ON THE ROAD, I definitely expect to delve into Gilman’s backlist. This is one of my top three reads for the year so far. (Along with POWERS by Burton/Hetley, and BONE GAP by Ruby, if you’re keeping track.) It certainly goes into the possible-Hugo-nomination file on my Kindle. That actually gives me five possible titles to nominate, so we’ll see if I read anything in the next month that bumps one. It’s not just the leisurely pace, either. We also get two points of view in this story. The primary protagonist is a teenage girl, but the secondary pov protagonist is a young man who’s probably about eight or ten years older – definitely not a teenager. I strongly suspect this would be another issue for many editors: YA novels today are mostly limited to just teenager points of view. My CITY IN THE LAKE is one of the few exceptions that I know of that was published in the last decade. I am certain that it’s harder to place a book with both teen and adult points of view than one that sticks to one or the other. Also, there is no romance in this book. These days, when YA fantasy sometimes seems to have almost become a subgenre of Romance, I bet that could have been a problem. So, my guess is that for all these reasons, SILVER languished until Saga, which is a new imprint and actively seeking great writers to take on, and is also showing a definite think-outside-the-box attitude, grabbed it. If I’m right and this book’s history is just like that, then good for Saga because they got a wonderful book. So, let me tell you about SILVER ON THE ROAD. First, the primary protagonist: Izzy. Izzy – Isabel – is definitely a perfect YA protagonist. She just turned sixteen and this story is all about her journey to figure out who she is and what her place in the world might be. This is a story about a girl taking her first irreversible steps into adulthood. Izzy grew up in the devil’s household, and she takes his power and authority for granted. More about the devil in a moment; the point here is, Izzy has lived her whole childhood around power and authority, and she knows she has a lot to learn, but she’s ambitious enough to want power and authority of her own. So right away she is not a sweet little girl. I mean, she’s not mean or vicious or deliberately bitchy, but she’s not sugar and spice and everything nice, either. She is ambitious, and at the beginning young enough to be focused mostly on herself and how others see her. She’s confident in some ways, tentative in others. She’s experienced in some ways, thoroughly naïve in others. She knows what she wants in some ways; has no clue in others. This sets her up to really grow into herself during the course of the story, so much so that, honestly, it does take this long, leisurely book to properly show her personal journey into adulthood and the acceptance of responsibility. Any shorter or faster-paced and I think Izzy’s personal story would have felt rushed. Next, the secondary protagonist, Gabriel. He’s the young man who offers to mentor Izzy on her journey through the devil’s Territory. Gabriel’s background and motivations are mysterious when we meet him, and at the end of the book he is still pretty mysterious, although we have been offered tantalizing glimpses of his background. We do find out some important things about Gabriel, though. Like, he has the good sense and self-confidence to decline a chance to bargain with the devil (yes, yes, more about the devil in a moment). Right at the beginning, Gabriel decides that he doesn’t need to strike a deal with the devil: if he can’t get what he wants by his own efforts, he can live without it. For me, that is an excellent introduction, because when it comes to a novel’s protagonist, I dislike impulsivity and greatly prefer discipline, restraint, and self-confidence. Also, Gabriel is not the sort of young man who would take on a mentor role and then seduce a girl so much younger. As I said, this is not a romance. I so much appreciated the way Gilman handled the relationship between Gabriel and Izzy. If a romantic relationship does grow between the two protagonists in a later book, I’m sure she will develop it in a slow and believable arc. Okay, second: the world. The slow unfolding of this world is such a delight! This story is absolutely for readers who love subtle worldbuilding, because there is nothing here that even faintly resembles an infodump. In fact, at the end, even though we’ve traveled through a good bit of the Territory with Izzy and Gabriel, we still have mostly guesses about how the world actually works. A first this looks like a fairly-close-to-ours Old West kind of setting, but it so is not. The United States takes up about the eastern third of our US; the Spanish lands of Nueva España take up the western third and stretch down into Central America, and the Devil’s West encompasses the middle third of the continent. So far, so good, but here in the Territory – the Devil’s West – the land is just saturated with magic. Which the characters never think about unless it’s relevant to the plot – everyone knows about it, so why think about it? So the reader is constantly tripping over one or another startling detail about rattlesnakes or whatever. Always be polite to a rattlesnake was the first lesson every child learned. I don’t know, maybe it’s better to encounter a rattlesnake that thinks it’s funny to make you jump than one that is just attracted to your warmth? Plus there are definite implications that magic is quite different outside the Territory. I have no idea how the various Native American tribes interact with the people of the United States or Nueva España, but in the Territory they have plenty of their own magic and nobody pushes them around. We barely see the Native Americans in this book, but in later books I bet we see more. In the same way, here in the Territory, the prayers of friars from Nueva España seem essentially powerless whereas the power of the devil is indisputable. But I kind of have a feeling that might not be true once you cross the mountains into the Spanish lands. The devil: So, when European settlers first crossed the seas to the New World, they found that a powerful, mysterious person was already there. He blocked them from their desire to expand their own lands, so they were predisposed to dislike him; and he makes bargains that are always scrupulously fair but often rebound in unwelcome ways. Of course they called him the devil. Now people travel from all over to make bargains with the devil, generally unwisely. The devil is a fascinating character. He is onstage only briefly, at the beginning of the story, but that’s enough to make it quite clear that he isn’t a normal human person. I sure look forward to seeing more of him in later books. Plus, one of the enjoyable little tidbits from the book is the way all the normal sayings about the devil take on a new and more literal meaning. Idle hands are the devil’s tools – because if you have nothing useful to do, he’ll find you some chores that need doing. Perfectly normal, ordinary chores. Third, the writing: Really strong. She had heard the stories, of course, about the great herds. She had seen the dark, shaggy pelts, thick enough to dig your fingers into, warm enough to laugh at a winter’s storm, but a pelt did not move, did not thunder, did not fill the world until there was nothing else but the immense, incalculable swarm of creatures moving across the land, dust raised for leagues in their wake. They were too far away to pick out individual details, the long black smudge and golden dusk behind spreading seemingly forever, and she thought that maybe the herd would never end, that it would continue forever, even after they had ridden on, pouring from the horizon until the sun set again, thick hooves setting their medicine into the dirt and stone. “Can you feel it?” Gabriel asked her, and she nodded, unable to speak. Like the river when it was in full flood, or the boss when he was angry, restrained but powerful, pressing against her until she couldn’t breath and didn’t need to breath. The thundering of their hooves was her heartbeat, the beat of the stone beneath their feet, the air heated by the snort of their breath, and the warmth of their shaggy hides the pulse of blood under her skin . . .
And then the herd let go of her, so suddenly that she fell back into the saddle, not even aware that she’d risen in her stirrups, trying to see better. I bookmarked any number of pages. It was hard to choose a representative sample. I love the ambiguity: do the bison herds in the Territory really have their own kind of magic? This is never explained outright, but I sure bet they do. Everything in the Territory seems to. Lots of other stuff is also left ambiguous or unexplained. Like one minor Native American character, Calls Thunder, is referred to with plurals. “They gave you a gift.” Why? I have no idea. And the demon, later, when we meet it. Them. Whatever. The word is used as though it is both singular and plural. They mythology behind this is not explained, either. There are many familiar terms that are applied to entities with which we really are not familiar at all. The minor character Graciendo. “He’s not . . . entirely human, is he?” Izzy asks. “Not even slightly,” Gabriel answers, and then reconsiders. “Well, slightly.” Okay, I’m intrigued. But we don’t find out the story behind Graciendo. We just get hints. This all contributes to the atmosphere of a setting that seems simultaneously familiar and very odd indeed. The one worrisome detail: The devil’s fundamental, overall bargain that holds for every entity in the Territory concerns being able to coexist with everyone else as long as you don’t give offense. If you offend someone, you seem to step outside the devil’s bargain and bad things can happen to you. Well, since it’s utterly impossible to go through your days without offending people, not to mention that some cantankerous people just aren’t happy unless they’re offended about something, it’s a bit difficult to picture how this rule could work. My guess so far, partly based on how the word seems to be used in the book and partly on just thinking about what might actually work, is that the term is actually reserved for, say, deliberate trespass against the important laws or customs or boundaries of people not your own. Like, if you’re a townsman and another townsman bumps you and doesn’t apologize, that doesn’t count, even if you get in a snit about it. But if you deliberately cross into a Native American tribe’s lands to hunt, then that does count, especially if you persist even after they make it clear you’re not welcome to hunt there. I’m pretty sure that’s the way the rule must be interpreted, and it does seem consistent with how it’s used in the book. Overall rating: Five out of five, obviously, and heading for a pretty good run at a ten out of ten. I’m very much looking forward to the second book, which I presume is coming out this year. I’ve read most of her books and, though I liked the Retriever series very much, “Flesh and Fire” really hooked me. In this well-wrought world, there is magic in the vine and wine is for more than drinking. Thanks, Kootch! In general I’d rather try a secondary world fantasy than a UF, so it’s helpful to know you give a thumb’s up to her fantasy trilogy. I’ve found Gilman’s work always competent but hit or miss for what worked for me. I bought this book because of the cover and because I knew it wouldn’t be a bad book. But Wow! 5 stars from me too. I had that lovely sense of ‘it’ all coming together; of an author’s skills and voice matching her intent and making something really great happen on the page. I really liked Izzy and Gabriel and the pace of the development of their characters. I liked Izzy learning and thinking. Seeing her analyse and think her way through choices (and being the one to see the possibilities and choices to be made) was such an important part of the story for me. Thank you for the heads up about the 2.99 price: 11pm on Feb 29 and I managed to pick up a couple of deals! For that price I’m willing to risk a book based on a few people recommending it, so I got Silver on the Road and Ken Liu’s Grace of Kings. I’m currently debating Our Lady of the Ice: Antarctic robot noir—sounds like it could be awesome! Kim, great! I was hoping I’d posted that in time to let people who might be interested grab it real quick. I see the price is indeed $7.99 now — well, I can’t help but hope that Saga finds enough of a sales boost from the lower price that they drop all their ebook prices again by, oh, just taking a random date here, November 8th. I just read this last week. Between the rich language, the intricate world building, and the ambiguous characters, it was definitely worth reading. I read a review somewhere that said you could track this book against Campbell’s Hero with a Thousand Faces and check off all the points on the hero’s journey (Call to Adventure, Road of Trials, etc.). 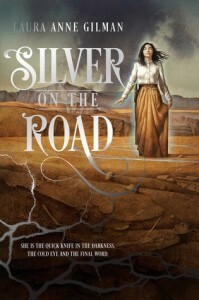 I just think of Silver on the Tree as part of the Dark is Rising series, so I barely notice it has a title of its own! It *would* be kind of fun to open up Campbell’s book and actually try ticking off all the points. I could believe Silver on the Road hits them all because it really is a very definite Hero’s Journey kind of story — just really well done and in a great world. In the last few days I read Six Gun Snow White and a couple other ebooks I picked up in that sale. Yay for having enough brain power to read again! Yay indeed! Definitely better when the baby’s on a consistent schedule, I’m sure! You made the author two sales. I got the ebook and the Teen, after reading over my shoulder, ordered the hardcover. I just finished it – very well done. I was actually surprised in the best way, and that doesn’t happen as often these days.